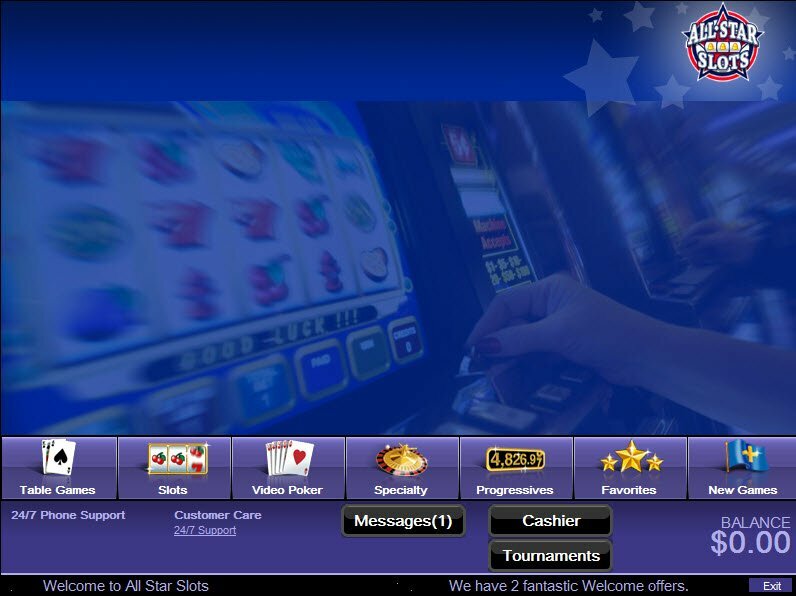 All Star Slots Casino is part of Club World Group and has been around since 2008. Club World Group itself has been going since 2005 and has received the following awards, some year after year: Best Customer Service, Best US Friendly Casino and Best Casino Affiliate Program. As of yet, All Star Slots Casino doesn’t support flash games to play in your browser but, with the All Star Slots Casino download taking just a flash, it is not so much of a problem. Sign up is easy and well laid out in three different windows. Real Time Gaming, also knowsn as RTG, supports all of Club World Groups casinos and, All Start Slots Casino software is no different. You can be sure you are getting a smooth, US players' acceptable casino with RTG. All Start Slots Casino Games aren't just all about slots and, you can find America's favourite table games, including the elusive Pontoon and Vegas Three Card Rummy. There is not a European nor French Roulette wheel in sight, just good old Super 21 and Let 'Em Ride. When you pop into the speciality menu, we find out where our European and French roulette wheels are hiding, how very American of them! All Start Slots Casino speciality games also includes Sic Bo! The jacpots available aren't to be sniffed at either, just because they are not progressive, does not mean it is not worth playing a good slot game with a nice bonus round, such as Funky Monkey or Jazz Time, and putting a couple of thousand in your pot! 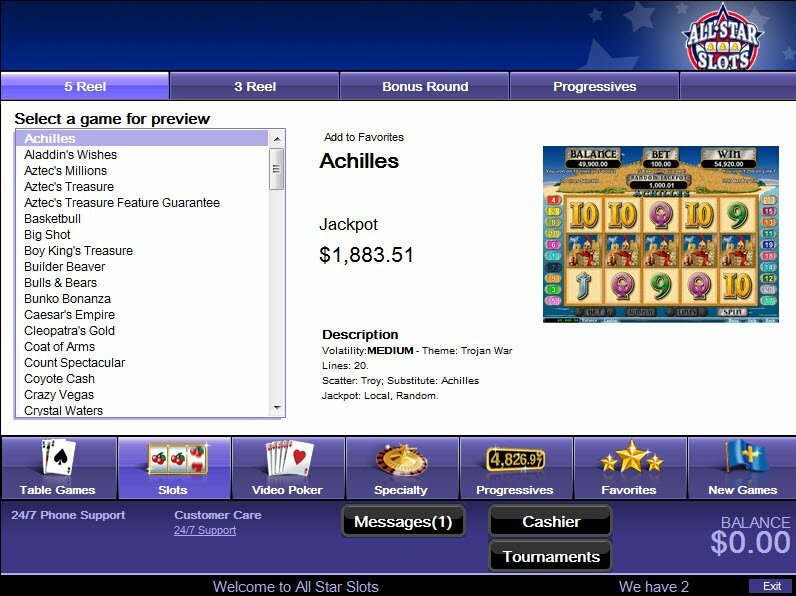 All Star Slots Casino games like progressive slots also include Aztec's Millions, Jackpot Cleopatras Gold, Jackpot Pinatas, Shopping Spree II and Spirit of the Inca. Whilst that is just a five trick pony of progressive jackpots offered, wait til you see how high these jackpots reach! $1,527,282.86 is the amount Aztec's Millions is currently on. Let us not forget where All Star Slots got its name. The slot machines on offer here are extensive indeed. Neatly labelled with 5 Reel, 3 Reel, Bonus Round and Progressives, it is easy to find exactly what you are looking for. The jacpots available aren't to be sniffed at either, just because they are not progressive, does not mean it is not worth playing a good slot game with a nice bonus round, such as Funky Monkey or Jazz Time, and putting a couple of thousand in your pot! All Star Slots Casino comp points are heralded by them as, just like a club in Vegas, except, instead of a free buffet they just give you the money! You get 1 comp point for every £10 you wager but, certain games and events can double, or even triple the rate. Each 100 comp points can be converted into a dollar. Every little helps! That dollar could win you the next progressive jackpot you know. There are also some awesome daily promotions to be had. 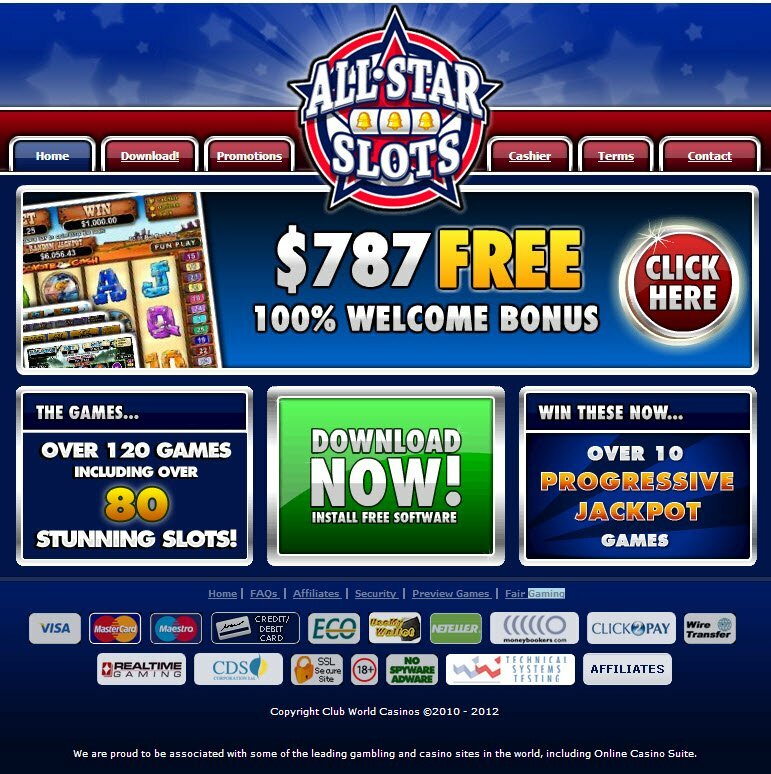 Currently, there's an All Star Slots Casino 70% deposit coupon for slots, scratchcards, and Keno. The welcome bonus offered by All Star Slots Casino is nothing out of the ordinary, just the usual 100% free up to £787 - this figure must represent one of our All Star NBA basketball players numbers but, I am not much of one for American Sports and, Julian is currently out so can't laugh at my poor sports general knowledge! There are onlysevendeposit methods available to you and, interestingly enough, there are 9 withdrawal methods. Most of us have a credit or debit card so, it is not the largest inconvenience to have to forgo our favourite payment method for a spin on these All Star Slot reels. Customer Support comes in the form of 24/7 Live Chat and toll-free numbers within the US only.